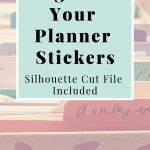 So you have so many planner stickers that it is hard to find the ones you want when you want to use them? Me too! 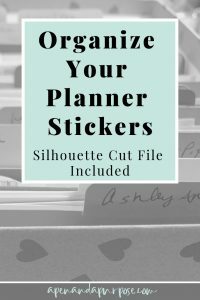 Here are some ideas of how to organize your planner stickers. Over time I’ve gathered A LOT of planner stickers to decorate with and I’ve been kind of feeling like I’m drowning in stickers. It’s hard to find what I want to use when everything is in a big pile. I’ve used these photo albums but found that I don’t like pulling out the big book and flipping through the pages to find stickers. It is also kind of a pain to put all the sheets of stickers in all the little slots. These albums hold 300 stickers sheets, so that is a lot of pages to flip. I liked having the stickers organized by size and subject but overtime I was getting lazy about grabbing the book since it is kind of large and feels unwieldy. So I decided to use a bin. Next I used a clear bin with all of my stickers. While it was nice having all of my stickers in one place, it felt a bit messy to go through them all. It also felt like a bit of a pain to pick it up bring it to my desk (where it took up a lot of room) and then sort through all the stickers. So next I chose decorative photo boxes. Functional stickers such as those with words, appointments, boxes to write in, things like that. This was my favorite but I still felt like it was hard to go through all the stickers to find what I wanted so I decided to create some folders with my Silhouette machine. The pattern I created is a cut file for the machine which allows me to cut out small sticker sheet size file folders for my stickers that I am arranging by shop and/or category. I make the folders out of this cardstock which comes in a large variety of colors and is perfect for making these files. I really like having multicolor folders because I think they are pretty cute. The folder measurements including the little tab on top are 7.5 X 8.825 and fit perfectly in the decorative boxes I am using for sticker storage. So far I’ve organized one of my four boxes of stickers and I love being able to pull out the folder for the stickers I am looking for when doing my planning instead of wasting time flipping through a bunch of stickers! Talk about rabbit hole. The way I thought of this was: how would I typically look up the stickers I need when working in my planner? I’ll probably also make a bunch of categories like by color or by events (holidays, etc). 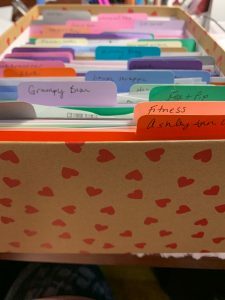 I need to make sure I don’t go overboard on creating too many categories, but I also want each folder to have some good meaning for me so they are useful. When you enter your name and email into the form above you will receive a zip file including three different folder cut files made for the Silhouette cutting machine.